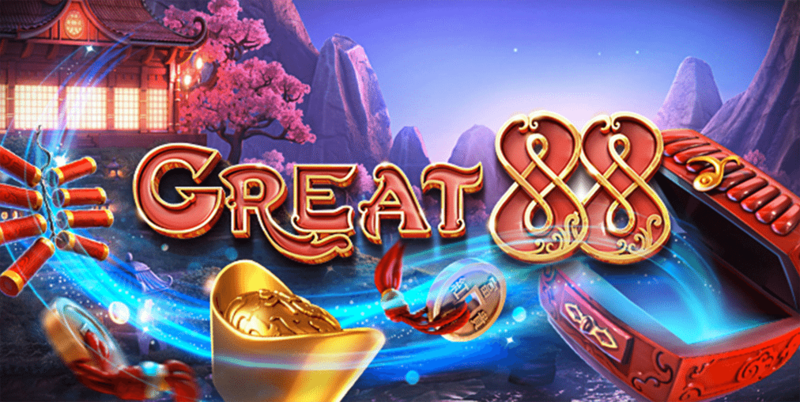 Inspired by the ancient traditions of eastern Asia, the Great 88 online slots game offers some massive jackpot payouts and a diverse set of rewarding bonus rounds. Read our in-depth review to find out all there is to know about this feature-filled Betsoft slot, or head straight to one of our approved real money slots sites below to start playing now. Great 88 features a classic five-reel video slots layout with 30 fixed paylines, five bet levels and three coin options (0.02, 0.05 and 0.10) for a $0.60 minimum bet and a $15 max bet. It oozes old-school Asian charm with a mystical, harp-infused soundtrack and traditional Chinese symbols such as dragons, firecrackers, jade frogs, bamboo sticks and lucky eights. “We are very pleased with GREAT 88,” says Stephen Jackman, Betsoft’s Head of Product Development. “A beautiful and strong theme that pays homage to the timelessness of Asian architecture and styling, this true 3D video slot is packed with the features that have defined Betsoft as the leader in iGaming evolution. Although the Great 88 slots game is loaded with several high-paying line win combinations, the real action happens when you land three or more Lucky Box feature symbols anywhere on the reels. At the end of the spin, the boxes will open to reveal some very special surprises. Top Symbols – Lucky Boxes may contain either of the two highest-paying symbols in the game: the Dragon and the Lion. These can combine with standard Dragon and Lion symbols already on the reels to form huge line wins. Instant Wins – Each Lucky Box may reveal either one, two, or three Bronze Coin multiplier features. 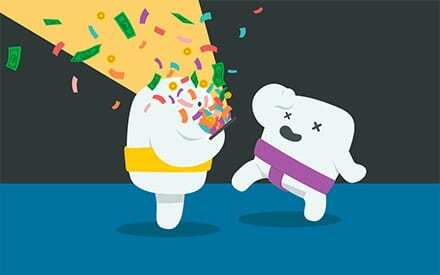 The more coins you get, the higher the multiplier. You can win between three and 15 times your total bet staked. Firecracker Wilds – When the Lucky Boxes are filled with wild features, each will explode to turn either one or two nearby symbols into substitutes. That means you can have up to nine high-paying wilds on the reels at once. Free Spins – The Jade Coins feature unlocks up to 25 bonus spins. One coin opens up three free spins, while the maximum three coins give you the full 25 free spins. Lucky Boxes do not feature during free games. That means you can score a fixed slots jackpot of more than 1,000,000 coins (up to $90,000) on a single spin. 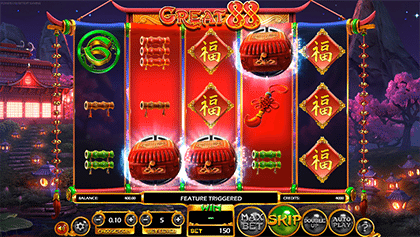 The Great 88 video slot is available for real money betting at all leading Betsoft slots sites, including several of our most trusted online casinos. Follow the links in our table above to sign up and check out the range, try games in free demo mode and, when you’re ready to play for real, add some cash to your account to take advantage of the exclusive casino bonuses on offer. 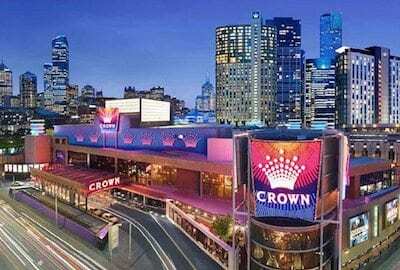 Not only do the safe casinos above feature the complete collection of Betsoft Slots3 slots for PC and Mac, they also offer hundreds of mobile slots for real AUD betting – including top titles like Great 88. These secure mobile casino sites are fully optimised for popular web browsers such as Chrome, Firefox and Safari on all major operating systems, including Apple iOS, Google Android, Windows Phone and BlackBerry. Like all Betsoft slots and online casino games, Great 88 looks stunning. We also love the traditional Chinese soundtrack, which is endlessly soothing and free of those hooky, ear-work melodies you find in some online pokie games. The first thing our testers noticed was that regular line wins aren’t that easy to come by. They tend to come when there are wilds on the reels, and it often feels as though you are just as likely to strike a Lucky Box bonus feature as you are to string together a standard three-part winning combination. But that’s the upside. In exchange for fewer bet line combos, you have a real chance of unlocking feature wins on a regular basis. This high-volatility gameplay style might not suit players who need regular wins to stay interested, but it is good news for mobile and online slots players who want that potential for really big wins at very modest betting stakes. Play Great 88 and hundreds more immersive slots games at Guts.com – one of the world’s top Betsoft casinos for desktop and mobile gaming.